Xinsheng “Cindy” Cai is a principal researcher at AIR. Dr. Cai has extensive experience in applying advanced research methodology and statistics in designing, conducting, and managing complex tasks and projects in large-scale multi-site evaluations, meta-analysis, and knowledge translation. 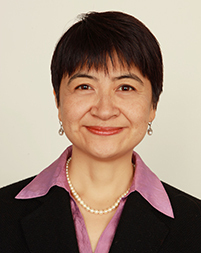 An expert in knowledge translation (KT), Dr. Cai is the co-chair of the Knowledge Translation and Implementation Coordinating Group of Campbell Collaboration. She directs the Model Systems Knowledge Translation Center providing management oversight and intellectual leadership on all aspects of the research, development, dissemination and utilization tasks. Dr. Cai is the principal investigator of two knowledge translation subgrants funded by Centers for Disease Control and Prevention (CDC) to study policymakers’ needs for traumatic brain injury (TBI) data and to develop the policy factsheet on the long-term effects of moderate to severe TBI; a co-principal investigator of a grant to translate wheelchair safe transfer techniques for consumers and clinicians; a strategic advisor on the Expert Advisory Panel for systematic reviews for the World Health Organization (WHO) guidelines on health policy and system support to optimize community health worker programmes. Dr. Cai is also the quality assurance reviewer of Center for the Knowledge Translation for Disability and Rehabilitation Research, Knowledge Translation for Employment Research Center, and a project funded by Patient-Centered Outcomes Research Institute to develop research fundamentals and training resources for multi-stakeholder research teams, and a subject matter expert for Patient-Centered Outcomes Research Translation Center. To support individuals with disabilities to obtain and maintain gainful employment, Dr. Cai leads large scale evaluation of career pathway demonstration projects in Kentucky and Virginia. In addition, Dr. Cai managed the development of the Adolescent Literacy Practice Guide for the Institute of Education Sciences (IES); directed the multi-year, multi-site survey study of the GE Foundation’s Developing FuturesTM in Education Initiative; led the evaluation of the Power Up What Works and Doing What Works initiative; and served as a senior advisor for the Knowledge Transfer Workshop for the Rehabilitation Services Administration. A What Works Clearinghouse (WWC) certified reviewer, she authored numerous WWC intervention reports.